I had a few friends and acquaintances that went on hiking expeditions and ballooning over Cappadocia and raved about their experience. When I told an acquaintance that I was going to Cappadocia, she recommended that I stay at a cave hotel owned by her old Cal Berkeley professor, one of the modern-day troglodytes who gave up teaching and returned to Turkey to dig in and carve out a niche (pun intended) in Cappadocia’s booming tourism industry. 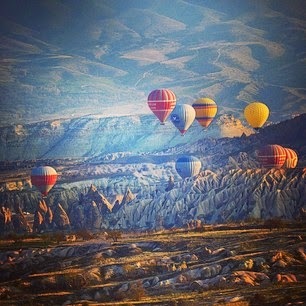 I had seen the Cappadocia landscape featured in travel magazines. So I came to Cappadocia with very high expectations. 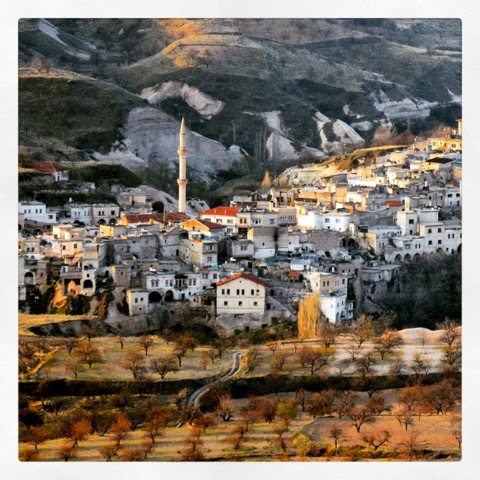 I mentioned in an earlier blog that the drive to Antalya was one of the most beautiful in Turkey. However, the drive to Cappadocia was even more beautiful. We drove past rolling hills and past monumental skies and climbed up mountain passes surrounded by beautiful landscape – majestic mountains with alternating greens and naked bedrocks of gray and red, snow-capped mountains and mountain ridges screened by mist of grayish-blue. I was enjoying the spectacular landscape and letting the mountainside roll on by that I occasionally tuned out to our guide’s narration about history and politics (including a talk about the Turkish prison in the movie “Midnight Express”). Hence, I missed most of his narration about Cappadocia’s long history that dates to five century BC, and who peopled it – from the Bronze Age to the Hittite Empire, to Phrygians, the Medes Empire, to the Persians, to Alexander the Great to the Romans, the Ottoman Empire to the current day Turks. Our bus tracked down Silk Road caravanserais that date to the 13th century. We visited the Sultan Han caravanserai in Aksaray, said to be the best example of Anatolian Seljuk architecture. Within minutes of arrival in Cappadocia, I realized that I did not have to learn all that history to appreciate the place. For me, its history could be summed up in one sentence: Millions of years ago, volcanoes erupted over a broad strip of the eastern Anatolian plateau in central Turkey, leaving behind mushroom-shape rocks, cone-head pinnacles where people carved out dwellings. Today, it looks like a setting from some pre-historic movie or “Star Wars" movie trilogy. Not only does the valley have great natural beauty, there are hundred churches carved in the rocks with colorful frescoes and paintings on the walls. We were not allowed to take pictures of the frescoes inside the church. And for good reason; The churches were once vandalized ruining some of the paintings on the wall. The frescoes or paintings that were once covered in soot had been restored to their present day state. The church walls were painted with animals, geometric and crucifix designs; frescoes depicting scenes from the Bible and the life of Jesus in the form friezes within borders; Deesis (Byzantine art of Christ enthroned and flanked by the Virgin Mary, St. John the Baptist, other saints and angels) on the apse. We also visited Ozkonak underground city with stone doors, air vents and water well, bedrooms, wine cellar. Interesting to note, the picture below is labeled 'winery' (goes to show that wine is as old as time).